Its that time of year for it, making new dreams, New Years resolutions, promises, getting more determined that this next year will bring at least some of our dreams to fruition. Well actually, here’s a confession, I never make New Years resolutions, ever. I figure that if I want to do something that bad why wait till January 1st to decide and do it!? I mean, want it, or not? Ok so I am bad at waiting and impatient at best. I might sometimes take a long time to make a decision but once I made it, I dont hang around. Action oriented, thats me. So I for one won’t have some responsible New years resolution to break at my first opportunity (yes thats another reason I dont make them!). I already decided that I love my dreams, and if they come true thats great, if they dont, the best thing is I still have them. Sometimes I replace them with new ones, or make adaptations to them, occasionally they even do come true 🙂 But I do find that having dreams is something of a comfort as they become familiar like a best friend, always there for inspiration and motivation. Sometimes I have actual dreams. And remember them too! Not all that often but perhaps thats because I dont really sleep as much as I should.. but anyway, I also occasionally dream about yarn (and I am pretty sure that won’t surprise you) or about something I am going to weave or make. Its pretty cool when inspiration comes to you in a dream, its like all the hard work of thinking has been done automatically and your subconscious is just offering this wonderful idea as a reward for just being a good girl and getting some sleep! I thought I would share with you how I made this one, its pretty simple, but I think its really effective! So basically, this is a three ply yarn, spun as three singles, then plied twice. I first made a brightly coloured single from the hand dyed pinky purply fiber. I used commercial roving for all the singles, to make a smooth yarn and keep good definition between the plys, but its also fun to make the first single in a textured yarn too, like a lockspun. Then I made a second ply of a simple black single. Next I made an (overtwisted!) two ply of the black single with the coloured single, creating a kind of candy striped yarn of the two. The reason for over twisting this ply is because it is then plyed one more time, in the OPPOSITE direction from which is was last plyed. Having the extra twist in it means it won’t fall apart when you ply it again. And on the third ply, I used one more simple black single, which has been spun in the opposite direction from the first (so the second single should be spun in the S direction!). As this second black single is added in the third ply stage it will create this great corset kind of criss-crossing effect, I think its amazing to watch this happen! And it looks like the coloured single is just hiding there, cocooned within the black. Its a really simple technique but a great effect that looks more complex than it actually is. The only trick is to make sure your two ply is overtwisted well enough to be re-plied in the other direction, you can check this as you ply your two ply by pulling some back off the bobbin and making sure it will twist up on itself. I was trying to figure out how you did that! It’s gorgeous. This is quite a coincidence….I used pretty much the same technique to make my module one yarn for the Journey. But I used a solid as the central yarn, with multi-coloured wrapping plies. Its such a nice technique Sandy, and your yarn was lovely! I these the first time some months back when I got my new favourite book, its inspired by one of the techniques in the ‘Spinners Book of Yarn Designs’, and I added my own ‘twist’ with the colour inside the black. 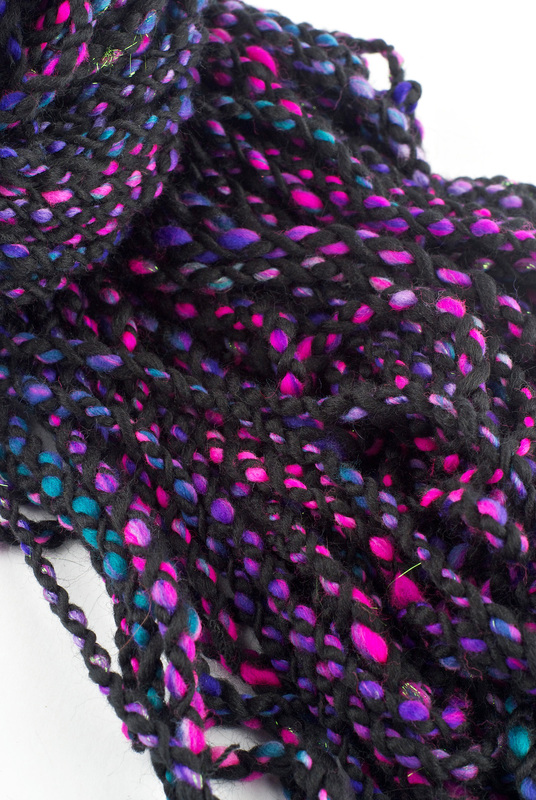 Its really cool how something as simple as colour combination and placement can change the look of a yarn so much, and there are so many variations possible, I loved your use of the colour on the outside of the solid center! Does that mean that the third single (the second black single) is spun in the opposite direction to the other two singles? Yes Sapape – I will add that to the post! Everything is plied in the opposite direction to which is was last spun or plied, so the first singles are Z spun as usual and S plied as usual, and the final single needs to be S spun in order to work with the Z ply direction of the final ply stage. It is also possible to reverse the order of this if you want to be sure to finish your yarn with an S ply, that can make some small difference to knitting or crochet uses. grazie per quest’ultimo regalo del 2013! e grazie per quello che hai scritto: è verissimo, almeno per me! E’ bello realizzare i nostri sogni ed è altrettanto bello non realizzarli perchè vuol dire che ne abbiamo ancora e ci faranno compagnia…… Buon 2014!!!! Thank you Guilia, really glad you enjoyed the post, and Happy New year! !